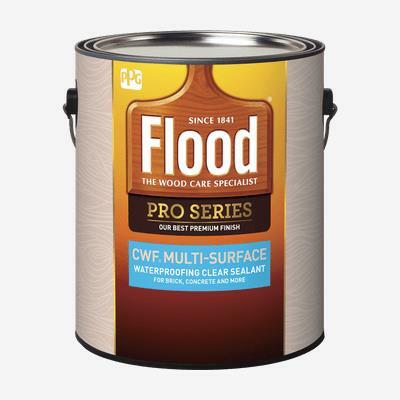 FLOOD® PRO CWF® Multi-Surface Waterproofing Clear Sealant protects against moisture damage. Recommended for use on properly prepared exterior surfaces such as concrete, stucco, masonry, grout, mortar, terrazzo, wood, wood shingles, pressure treated wood, wood decks, outdoor wood furniture. DO NOT use on plastic, rubber, vinyl, tile, asphalt, or any sealed, nonporous surface. A test application is required to ensure proper absorbency.